Typing at work on Microsoft’s new 15-inch Surface Book 2, I can’t shake the feeling that this thing’s not for me. Don’t get me wrong, it’s a powerful laptop, it’s beautiful, and the workspace its giant screen affords made me completely forget I wasn’t seated at my desk with my usual 34-inch extra-wide display. So sure, the thing is for me, in the way that a very expensive sports car will most definitely sit in city traffic for hours right next to a yellow cab. But do I need the thing, and should I spend $3,300 on it? Of course not. 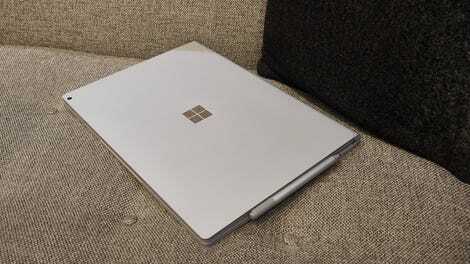 When the original Surface Book first arrived in 2015, its unique detachable screen concept felt like a revelation—at the time it seemed genuinely innovative in a way that might bode well not only for users of the machine but for Microsoft itself. The thing was cool, and as an emblem of the types of futuristic computing experiences Microsoft claimed it was trying to create, it was impressive. For design nerds and tech enthusiasts, it’s easy to get excited by ambitious products like that. And in a way it worked on me. I haven’t used anything but a Windows computer since. An updated version of Microsoft's cool, if overengineered laptop. $3,300 as reviewed. Starts at $1,500. Two years on, the refreshed Surface Book line looks even more like a monument to Microsoft’s biggest ideas. In the intervening time, Microsoft’s doubled down on its mantra that its devices and software are designed for artsy types. Last year’s big Microsoft hardware release was the impressively designed, if maddeningly niche Surface Studio. While the company’s recently released Windows 10 “Creators Update” didn’t offer much a regular person could get excited about, it included improvements if you’re using the Surface Pen stylus or want to experiment with Microsoft’s nascent Mixed Reality platform. A 13.5-inch Surface Book is much smaller. The new Surface Books, which come in 13.5- and 15-inch flavors now, are very powerful laptops with top-end guts and premium price tags befitting other high-design, high-spec machines like the MacBook Pro or Razer Blade Pro. The 15-inch version I tested sports a new eighth-generation Intel Core i7 processor, 16GB of RAM, and Nvidia GeForce GTX 1060 graphics. Mine was priced at $3,300 thanks to 1TB of storage, but it starts at $2,500, with 256GB of storage. You can of course scale back to a 13.5-inch machine with 8GB of RAM and Nvidia GeForce GTX 1050 graphics for $2,000. If you don’t care about Mixed Reality, or gaming, or Microsoft’s lofty talk, there’s even a 13.5-inch starter model without integrated graphics and last-year’s (totally fine) Intel Core i5 processor. In our battery rundown test, the 15 incher got a solid 10 hours. I was able to work most of a long day without power. It’s a very nice machine if you want to play copious amounts of Civilizations VI. The Surface Book 2 is still all about design, and with the exception of a touch here or there, the hardware of the device hasn’t changed all that much. While elegant, the design is still a little finicky. The ribbed hinge that makes the device’s detachable screen magic possible remains a little odd in the way it closes. I still find it very annoying to connect headphones into the display at the very top of the device’s screen when it’s in regular clamshell configuration. The keyboard is satisfactory and the trackpad gets the job done. At least now you can charge via USB-C. True to its premium price tag, the Surface Book is an overall very striking piece of hardware. Mostly, that’s because the display is so damn beautiful. I swear, I could fill out spreadsheets for years on this thing. And Microsoft’s done an enviable job making what is admittedly a heavier and fussy device not feel totally unwieldy. I just barely stuffed the 15-inch model into my regular-sized backpack. Despite its heft, I was able to mostly carry it around and toss it on my legs like I would a much smaller machine. Oh, and I suppose I should mention that the new Surface Book finally has a USB-C port. It charges! It’s about time. The Surface Book is very powerful and super nice, but it brings me, again, to the question I started with: Who the hell is this for? The Surface Book 2 is made for a certain kind of monied super user with important and challenging things to do at all times. A well-dressed, spectacled titan of creativity that reshapes how the world works with each Surface Pen stroke. The ability to remove the Surface Book’s glorious display and hold it while pacing around a darkened room allows this person secrete just enough extra creative juice to redesign the way we in sit in chairs (or something). Does this person exist outside of intense television commercials? I’m not sure! These are all nice things, but I frankly don’t care about them, and I’m not sure how many people do. As one of my colleagues put it the other day, the powerful, pricey Surface Books are computers for people who have computers bought for them. I’m not surprised I don’t see any Surface Books out in the wild—I think most people would do just fine with a Surface Laptop or some other Windows machine. As I said before, in a price comparison, this thing costs more or less the same as a MacBook Pro, and has the bonus of better graphics and a touchscreen. 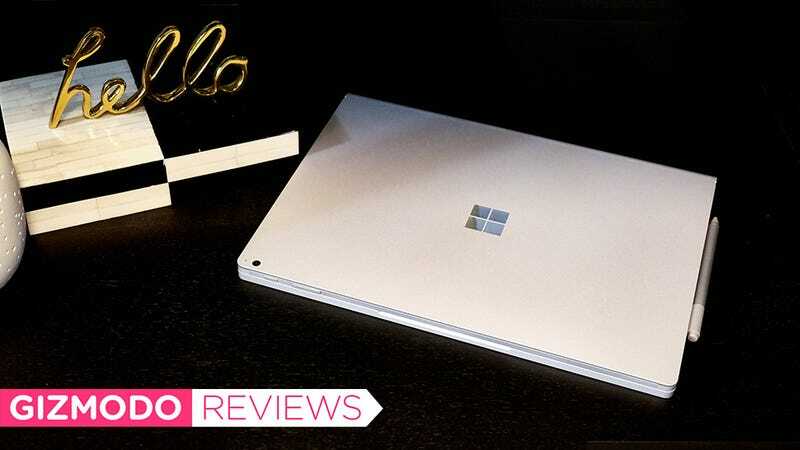 If you do fall into that class of people with important ideas and creative futuristic things to do—or maybe you just aspire to that fantasy—the Surface Book 2 is a whole lot of machine. Design is elegant if finicky. You will not be disappointed if you buy this thing, but you definitely don’t need it.